Right now, it is all about Pumpkin! I experimented a lot around this dish by adding tomatoes, or veggies or white sauce and finally came up with this clean version. The family lasagna has noodles but my 'lasagna' has no pasta in it, instead it has zucchini slices and it turned out delicious!!! Cook the turkey until nice and brown. Mix the pumpkin puree with the ricotta cheese. 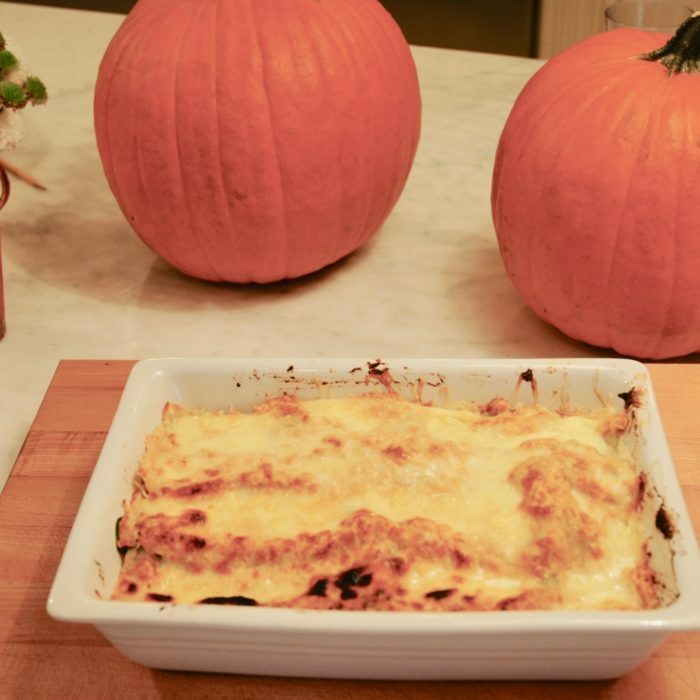 Start layering your lasagna but adding the meat, some spinach, noodles (I like using the ones that do not need to be cooked beforehand, it is less work) then the pumpkin-ricotta mix. Sprinkle some mozzarella cheese and start over again with the meat. Finish with both the mozzarella and parmesan cheese. Cover the dish and bake for 30 minutes, uncover and broil for 3-5 minutes until the cheese starts to get golden brown and bubbly.